My trip to Morocco is being interrupted by an unexpectedly long layover in Paris, where snow has shut down the airport and cancelled the last flight leg of my trip. I'm rebooked on a later flight, but it means I'll miss dinner with the other folks attending this conference. But I'm somewhere that there's WiFi. 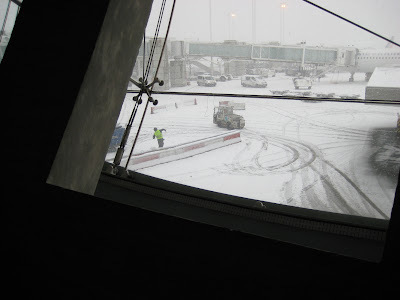 And the ground crews outside here at Roissy-CDG airport are enjoying throwing snowballs at each other, as you can see.